Both engines are new and will carry a full 2 year manufacturer warranty. They have less than 2 hours running time for commissioning purposes. Commercial grade tubes and hull. Fitted with jockey seating with deck foot straps non slip deck. Collapsible A frame with rear crash bar. Intercom system from driver to all seating (one headset). Comes with full cover for boat and outboards. On-board intercom installed with one headset supplied. This RIB comes with commercial grade tubes and hull. It is fitted with jockey seating with deck foot straps on the non-slip deck. There is a collapsible A frame with rear crash bar. This boat has been fully and professionally refurbished. New engines are fitted and come with a new full manufacturers warranty. Multiple trailer options are available. Example shown £3,000.00. Ex-MOD twin Axle trailer with both hydraulic and over-run braking. Fresh water flushing to all hubs. 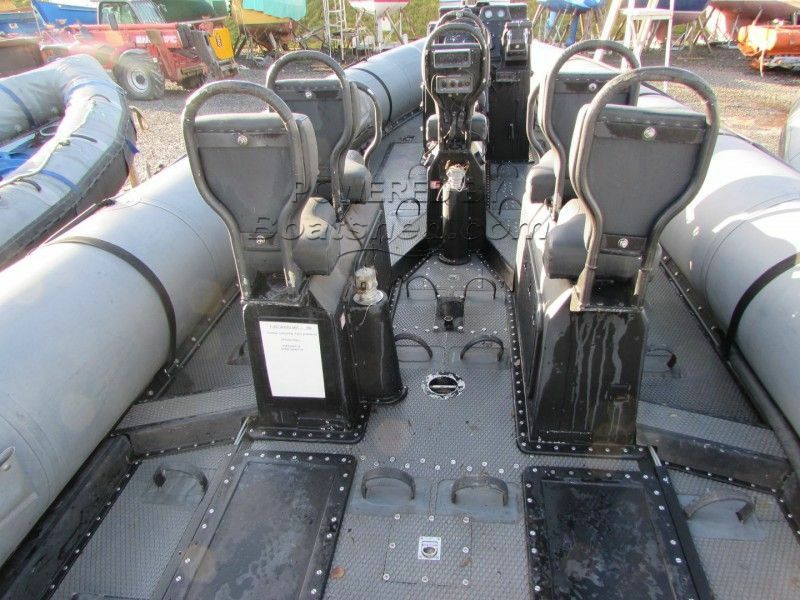 This Halmatic Arctic 28 RIB Ex-MOD has been personally photographed and viewed by Martin Docherty of Boatshed Scotland. Click here for contact details.